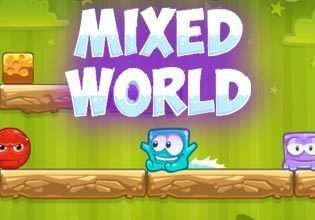 Welcome to Mixed World, the cheerful platform puzzle game! Use your brains and skills to help a bunch of cute creatures to chase off all the grumpy red monsters. Use your funny friends special skills to nudge all monsters off the platforms! Grab monsters or move friendly creatures with your sticky tongue! Slide over brittle stones and even through teleporters! Jump and shoot to destroy blocks and shove the grumpy critters out of the way! But be careful, the monsters will not make it easy for you! Only with the right tactics and timing you will be able to complete all challenges in time and to unlock all achievements. Play Mixed World now for free and experience countless hours of brain-teasing fun!